It was a rather poignant coincidence that I should be over in Hobart when the news broke of the discovery of one of the ships from Sir John Franklin’s expedition to the Arctic. There’s an interesting article about the discovery and a discussion of the political and historical ramifications here. As it points out, the territorial jockeying over the Arctic circle between Russia and Canada has taken on even more significance since the Ukraine crisis. Canada has adopted Franklin as a national hero, but Tasmania has a claim on him as well, as he was Lieutenant Governor of Van Diemen’s Land between 1837-1843. (This time period coincides closely with Judge Willis‘ tenure as judge in the separate colony of New South Wales across Bass Strait). 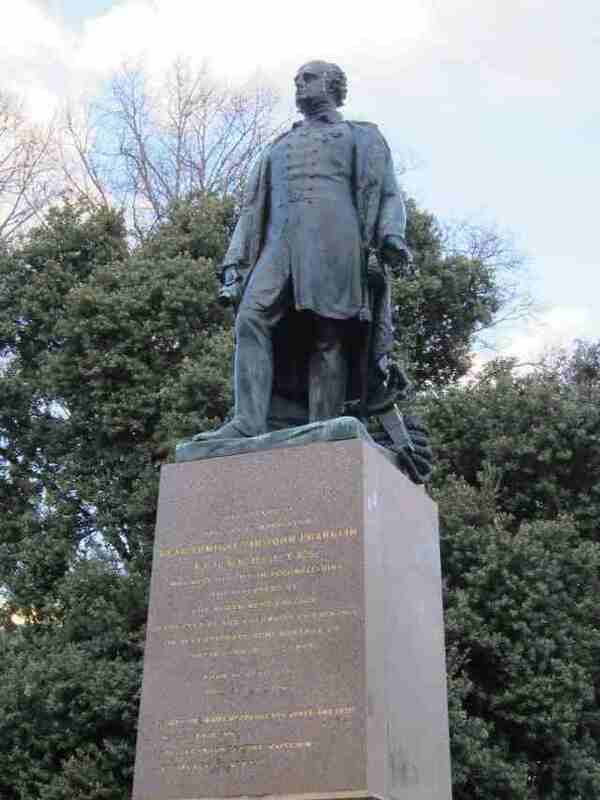 There’s a statue of Sir John in Franklin Park, the site of the original Government House. Kathleen Fitzpatrick wrote a lively and insightful entry on Sir John Franklin for the Australian Dictionary of Biography. It’s well worth reading. And of course, Lady Franklin, who made the search for any trace of her husband her life’s mission, features in several books that I’ve read and reviewed here. There’s Richard Flanagan’s Wanting, Penny Russell’s This Errant Lady, McGoogan’s Lady Franklin’s Revenge– and of course A.T.T. (after the thesis) (or maybe sooner) I’ll read Alison Alexander’s National Biography Award winner The Ambitions of Lady Jane Franklin. Walking around Hobart after the Transnationalism Masterclass, I stepped into St David’s Cathedral, and what should be hanging on the wall but this flag. 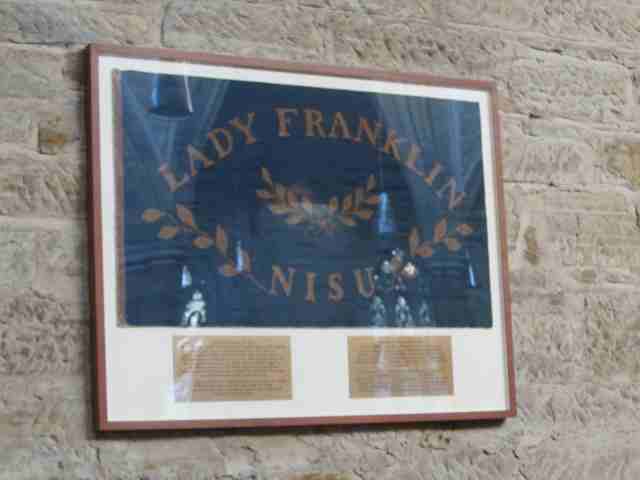 Lady Jane Franklin, respected and influential wife of former Governor Sir James Franklin, gave this simple flag to Lieutenant W. R. Hobson RN in 1857. Hobson was second in command of Captain McClintock’s Franklin Relief expedition, organized by Lady Franklin to search for her husband, lost in the Arctic. With one sledge drawn by four men and another drawn by seven dogs, Hobson crossed the Northwest Passage from Cape Victoria [indistinct- to Cape Felix?] on King William Island and on 3 May 1859 came across cairns [indistinct- erected by?] Franklin and his followers, which proved both their discovery of the North West Passage and their eventual fate in 1847. There’s a short podcast about the flag and how it came to be in the cathedral here. The fate of Sir John Franklin gripped the imagination of Britons, but it evoked anxieties as well. Stimulated by the recent news of the discovery of the wrecks, Laura MacCulloch, College Curator at Royal Holloway wrote a fascinating article on The Conversation website about Edwin Henry Lanseer’s confronting 1864 painting ‘Man Proposes, God Disposes’ that depicts of grisly outcome of the doomed expedition. Gory, yes, but more comforting perhaps than the rumours of cannibalism that so unnerved the British nation. On hearing of the discovery of one of Sir John Franklin’s ships- they’re not sure yet which one- I felt rather sad for Lady Jane. All those unanswered questions; all that fruitless effort; all that time. This entry was posted in Australian history. Bookmark the permalink.